When I was looking for a café bar franchise, I wanted a place that I would be proud to own, enjoy working in, and happy to invite my friends to. Puccino's was perfect. It's a brilliant business model. A really nice place and friendly staff means customers keep coming back and bring their friends. We currently have over 100 outlets across Ireland, the UK and Italy and Puccino's is the second largest operator on the UK rail network. I can't put into words how good the coffee is - it's the one thing that we do take very seriously and are immensely proud of. Our parent company, Segafredo Zanetti, is one of the largest coffee companies in the world. 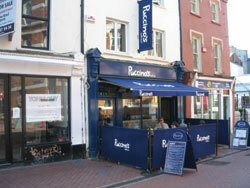 The key advantage of Puccino's is our high quality food and drink, commitment to customer service and great atmosphere. At a business level this means more sales; on a personal level you have to put your heart and soul into the business to be successful, so it's great to be able to do it in a really enjoyable environment. It is our sense of humour that distinguishes Puccino's in the market and engages customers. In fact, our customers love Puccino's so much that they keep asking for jobs! We have even found photographs that customers have taken of us then placed on the internet. We currently have five Café Bars and Deli Bars in Ireland and four new kiosks (three mobile self-drive Micro Vans at the Luas Park and Ride stops, and one permanent in Cork bus station). Thanks to our decade of experience, franchisees have the security of knowing that the concept is tried and tested, and finetuned in Ireland to suit Irish tastes. Franchisees will receive a minimum of two weeks' training in one of our company owned Café Bars in Ireland. We then provide Operations Managers to oversee the development and opening of the café and to stay with you for the first scary couple of weeks after you open. All product sourcing is done by us, and franchisees have access to an agency specialising in employment law and health and safety regulations 24 hours a day. This gives franchisees tremendous peace of mind and is I believe unique in this industry. We offer three packages starting at approximately 70,000 euros upwards. One customer summed up Puccino's perfectly for me - our cafés have a tremendous vibe, are fun, full of energy and we sell really great coffee. From Buyer/Planner to Puccino's franchisee has been a relatively easy transition for Gerrard O'Gorman, who has no previous business or catering experience. 'I like the product and the people behind Puccino's. I particularly like the personal touch that Alastair Spink, the Master Franchisee, brings and it was his personality and service ethic that really attracted me to the business. 'The first few days were hard work but I enjoyed every moment of it. Members of the Puccino's team spent the first two weeks with us which made a huge difference. There really is nothing like the real thing, but when we opened the business we felt confident. 'You have to bend over backwards for customers and that is how I like to run my business. Although the money side of the business is important, that comes automatically if you treat your customers well. It's really rewarding to receive compliments from customers and also to see staff grow in confidence. Franchisee Profile: Owner operators with personality, passion, who are not afraid of hard work and have realistic expectations. Mobile Kiosks: Business parks and travel locations. The product offer is fresh coffees, pastries, sandwiches and bottled juices & smoothies. Appr. 35,000 euros. Espresso Bars: Primarily station locations ranging from smaller suburban stations to large central city locations. The product offer is fresh coffees, pastries baked on the premises, fresh orange juice and other hot and cold drinks. The units can be either kiosks or fixed sites that allow seating. Appr. 70,000 euros upwards. Deli Bars: Unit sizes vary from very small 20 seaters to 50 seater cafés serving fresh pastries and sandwiches prepared fresh on the premises daily. Appr. 120,000 euros upwards. Café Bars: This is a fully licensed restaurant and coffee bar with a continental feel. We offer speciality coffees for those who just want a coffee and a full breakfast all day. The menu is very diverse including tapas and alcohol. The relaxed atmosphere includes sofas and soft lighting. Appr. 170,000 euros upwards.